I’ve never met Kerry but I’ve read her blog for a long while and like many other bloggers I was shocked and dismayed to hear of her plight. In the summer she suffered a brain haemorrhage due to a ruptured aneurysm. She has been in hospital ever since making little recoveries then suffering more setbacks. Her husband has been left in charge of their three small children and has been wonderful in keeping the blogging community up to date with her progress. I have been praying for Kerry and her family since hearing of her plight and will continue to do so, and I’m sure many others will join in, in whatever way they can. Update: It is now a little after 11pm on Sat 24th November and the support for Kerry has been amazing. The blog hop listed below has almost reached 100 posts, I’m sure it will be more by the time it has finished. 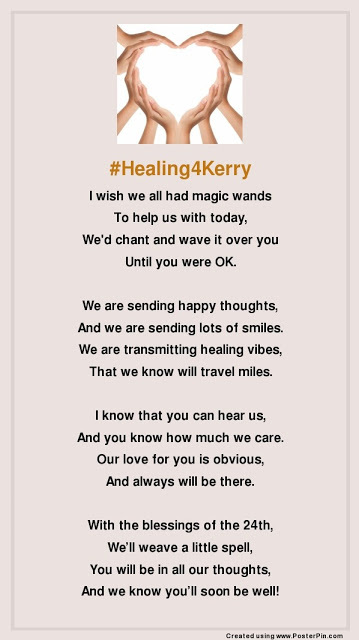 On Twitter we managed to get #Healing4Kerry trending for almost an hour. I hope and pray that we have made a difference somehow. Standing together to fight for this lovely lady, family, friends, acquaintances and strangers speaking out as one voice in support for her and her family. I truly hope she begins to recover now and is soon re-united with those that love her most. My girls have started having lunches at school instead of school meals. I’ve started having nightmares about what to put in said lunches. Who would have thought packing a small meal each day for little ones would be so stressful? Confession time: when my older two were little, they had in their lunch boxes exactly the same as mum would make me, one cheese sandwich, one banana and a packet of crisps. These days kids are taught about healthy food, crisps and such are frowned upon. Lunches have to be healthy and tasty. So let the nightmares commence. I have a board on Pinterest on Bento. 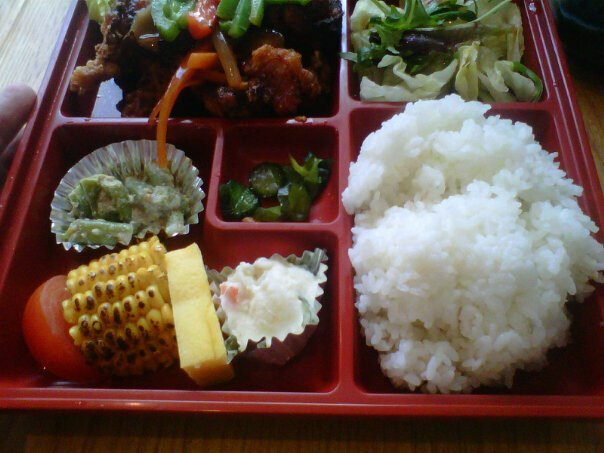 Mainly because Eldest Daughter is a big Bento fan and introduced me to it a couple of years ago. So I collected bento pictures and soon realised that I could do Bento style lunches for the girls. Pinterest is such a great resource for storing things of interest so I was soon finding all sorts of blogs and sites that are helping me think of new and interesting things to put in the lunch boxes. The lunch boxes I use most are Easy Lunchboxes which can be purchased from Amazon. I was lucky to win a pack of four in a competition a while ago. I love them because they already have little compartments. You can also use little boxes to keep things separate or even silicon or paper cupcake cases. The first time I used a sandwich cutter I was horrified at the loss of bread, what a waste. Well, it can always be used for breadcrumbs (and I’m sure to find more recipes) The thing is, if you put whole sandwiches you’ll probably end up with just as much waste at the end of the day. Most kids don’t eat all the bread. So Thanks to Pinterest my inspiration has been fired and I’m sure I’ll come up with some healthy and interesting lunches for my girls. Here is one of my early attempts. 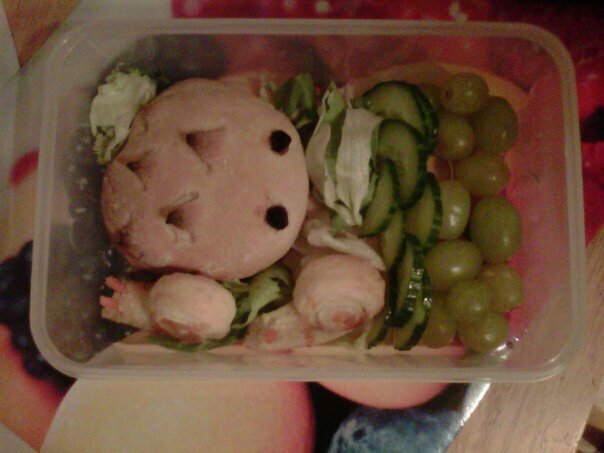 This is a home made bread roll hedgehog with raisin eyes, home made cheese puff snails on a bed of lettuce, with a cucumber fence and some grapes. Do share your lunch box ideas and recipes, and if you have any ideas of what to do with leftover bits of bread. Each month for the next 10 months Center Parcs will be setting a challenge and by taking part you could be chosen to be a Center Parcs Family blogger. For full details please see the Tots100 page. 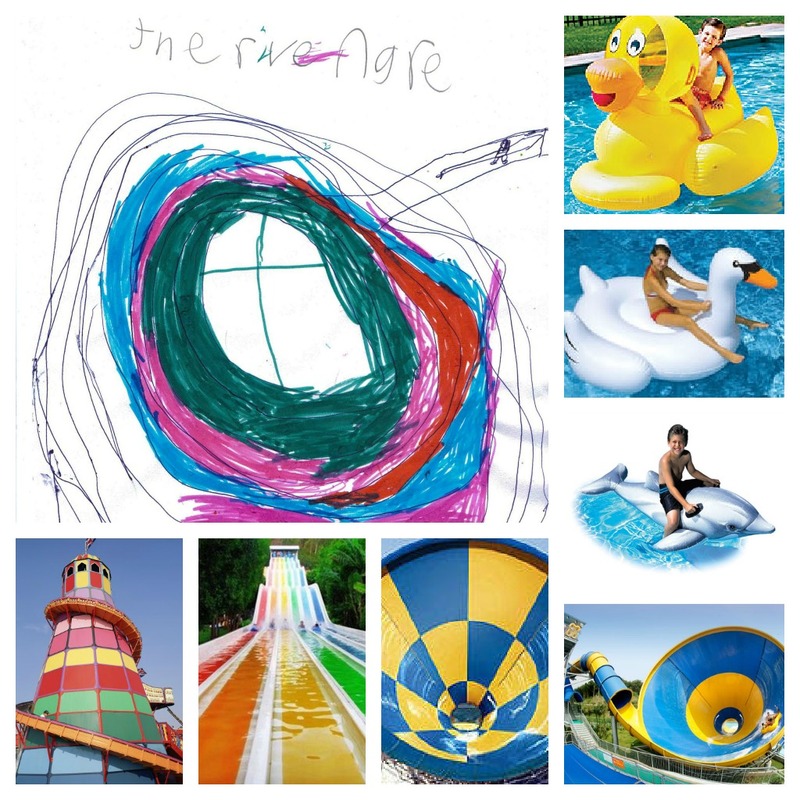 This months challenge is asking for you and your family to paint a picture or make a model of your dream water ride. This is what my daughters came up with. First I showed them the new water ride at Center Parcs Elvedon Forest, the Tropical Cyclone. Star decided to call our water ride The Rivengre. 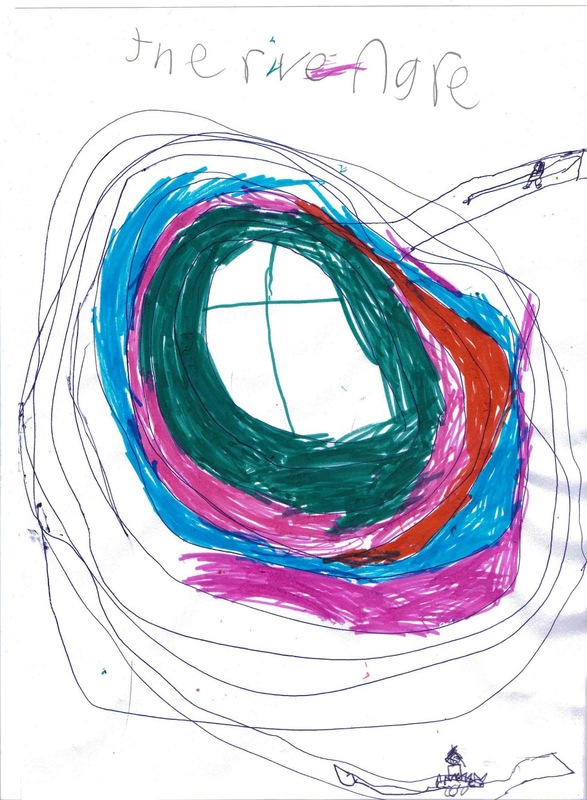 The ride would be all the colours of the rainbow and have lots of twists and turns. You can choose which colour you wish to ride down, but the colours will change on the way down to the pool. Each person would ride on an inflatable animal, from a crocodile to an elephant. Boo added that she would like the ride to be very very fast, little daredevil that she is. The ride would be like a helter skelter, but with several lanes. At the end it would be like a bumpy slide, the kind you get at fairgrounds, before you plunge into the pool, hopefully still on your inflatable animal. Here is a picture board we put together of The Rivengre, and the original drawing by Star. It took just five months and I was ready for my test. My lovely instructor assured me I’d be fine so long as I didn’t get Mr Brain as my tester. Guess who I got? Yes, Mr Brain! 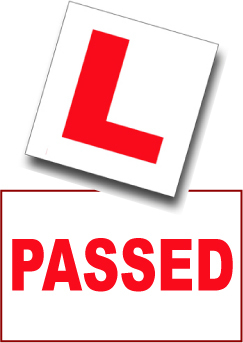 Apparently he was the worst in the centre and barely passed anyone, especially first time. 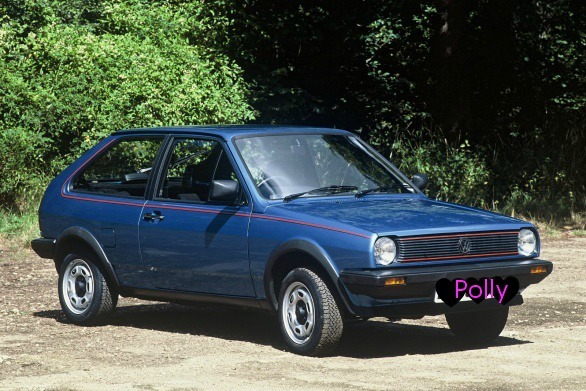 When she finally gave up on me, I traded her in for…..another VW Polo! I’d love to be able to ice skate, to glide along the ice with poise and grace, twirling, balancing, jumping feeling like my feet belonged to someone else. Ah, my feet would have to belong to someone else! Grace and poise are two things I really don’t possess, and I have no sense of balance. I’ve been skating twice and both times I built very strong relationship with the bar around the edge, which when I attempted to break free gave my bottom the chance to resume it’s relationship with the ice. And I’m not exaggerating. 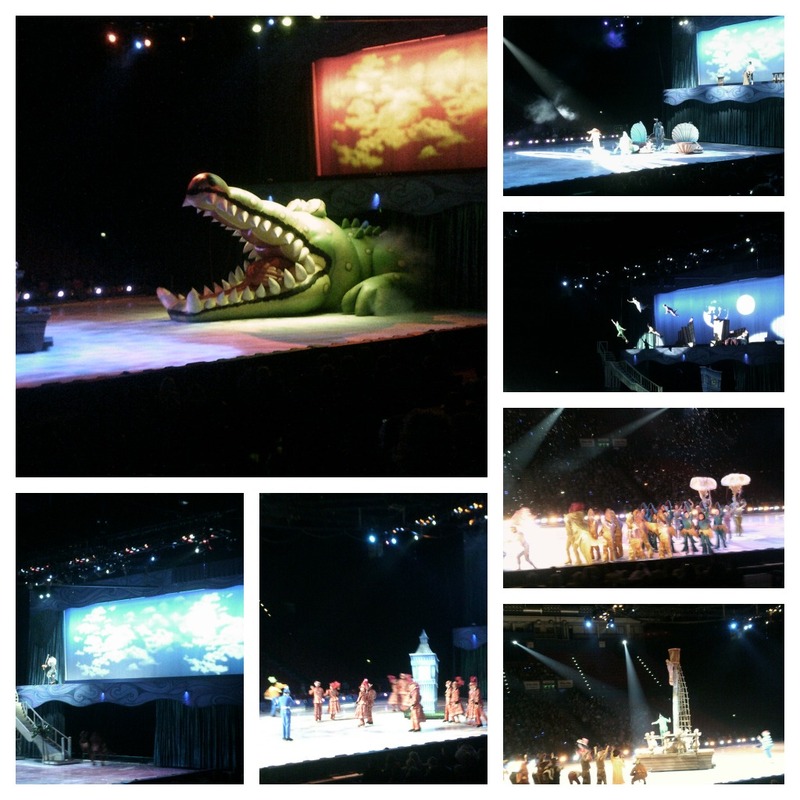 I do love to watch skating though and I was thrilled when my daughter brought home tickets to see Disney On Ice, Passport to Adventure home from school. I took my three girls with me, Eldest Daughter, Star and Boo. We had to go practically straight from school which meant dinner was had at a fast food restaurant. We managed to arrive at the NIA Birmingham with half hour to spare, which gave us chance to browse the incredibly over priced goodies on offer. I have been before so I knew before hand that I’d need to pawn the jewellery for this ‘free’ night out. Popcorn £8, candyfloss £7 and Slushie £8, I know they came with souvenir mugs and hats, which made them slightly more worth the price, but it was sad that you couldn’t buy them separately. The hot chocolate was only £1.70, I’m cheap and easily pleased. So goodies bought we made our way to our seats for the show featuring Micky, Minne, Donald and Goofy as they went on a magical journey to meet the Lion King, The Little Mermaid, Lilo and Stitch and Peter Pan. The girls loved it, Boo clapped so hard she made her hands red. They enjoyed the interaction and were old enough not to be too scared by the scary bits (The giant Ursula and the giant Crocodile) Star was a little freaked by the fireworks, but there wasn’t many. So we had a fantastic evening and would definitely go again.